Rh Negative Mother is at risk if the father is Rh Positive. Usually Rh Negative Mother gives Birth to Rh +ve Baby. An Rh Negative Mother should be aware of her pregnancy and the blood group of her husband. If you are Rh-Positive, your red blood cells do have a marker called Rh factor on them. Rh-negative blood does not have this marker. So when these two separate types of blood mixes there will be immune reaction. The body will make antibody against it and will try to destroy it. The full name of Rh factor is Rhesus factor. It is an antigen. people having this antigen is known as rh factor positive. If you do not have this antigen you will be called as rh factor negative. There are almost 30 blood group systems. You must be fgamiliar with the ABO blood group system. Rh factor is considered with ABO blood group system. And published as A+, B+, O+ or A-, B-, O- etc. The Rhesus factor gets its name from experiments conducted in 1937 by scientists Karl Landsteiner and Alexander S. Weiner. The problem of Rh Negative Mother giving Birth to Rh +ve Baby, is developing Rh disease or aka hemolytic disease of the newborn. This is a serious case and needs good care to prevent hemolytic disease of the newborn. When the father is rh factor positive and mother is rh factor negative, there is a chance of developing hemolytic disease of the newborn. It usually breaks down the red blood cells of the baby and anemia will develop. In severe cases this hemolytic disease can cause illness, brain damage known as kerneicterus and even death. Sensitization means that the Rh negative mother’s blood is exposed to Rh antigen. It usually occurs at previous pregnancy. Also it may occur through miscarriages, abortion, ectopic pregnancies and blood transfusions. The mother’s blood will then produce antibody against the Rh antigen. In further pregnancy, when this blood containing the Rh antibody enters into fetal body, it causes haemolytic diseases. Rhesus disease does not usually affect the first born child. Why is that? Because the mother’s blood is not sensitized yet to produce the antibody. If a pregnant woman is Rh negative and has not yet been sensitized, she usually will be given an injection of Rh immunoglobulin in about seven months or at 28 weeks gestation into the pregnancy. This will prevent the sensitization for the rest of the pregnancy. It is recommended by most practitioners. Although not practiced in Rajshahi Medical College Hospital. We usually give an Anti-D Immunoglbulin at end of delivery within 72 hours. What does it actually do? This anti d immunoglobulin will seek to destroy any antigen present in the mothers blood. Thus the antigen will not be exposed and no antibody will be created. After birth the cord blood samples from baby is collected and send for blood grouping test. If it comes positive, then the mother needs another round of Anti -D Immunoglobulin to prevent sensitization. 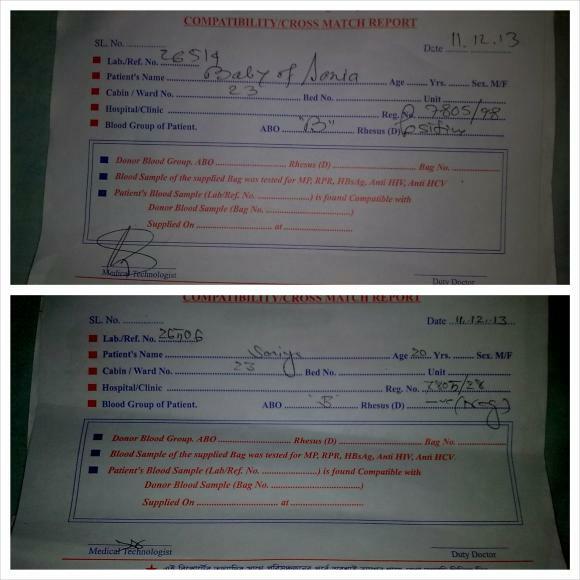 Pregnant woman is tested for Blood group and if they are sensitized earlier at pregnancy. As I am an Intern Doctor of Rajshahi Medical College Hospital (RMCH), I have performed such delivery of Rh Negative Mother giving Birth to Rh +ve Baby. Today I will show some photography and information about delivery of rh negative mother. 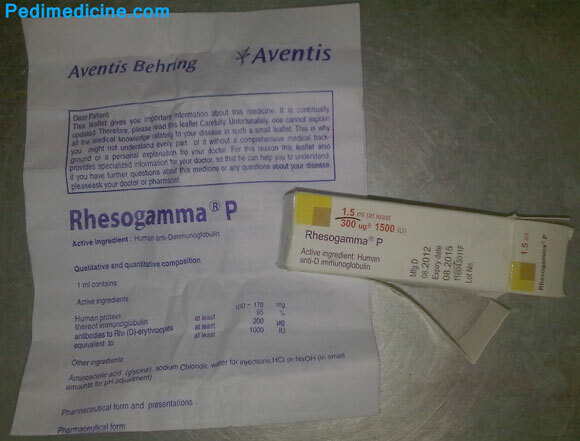 The Drug used in this case was Rhesogamma, registered product of Aventis Behring from Germany.